As its name implies, this bath can be very healing, especially in people with low vitality, low body temperature, and low reactivity. It is indicated for individuals with poor, slow, or no response to appropriately applied healing efforts. Often so much effort is given to detoxification that the body becomes strained and tired from being constantly challenged. This bath should be used at least once a week to assist the body in recouperating from this strain. Once again, this formulation is available as a product that I developed for the sake of convenience, but if you want to assemble it yourself, the recipe is below. * Optional -- Sip an 8 oz. glass of water mixed with 1-2 ounces of Ningxia RedTM Wolfberry juice while soaking in the bath. Wolfberry stimulates the anabolic metabolism (the building up of the tissues) and helps strengthen the body in times of exhaustion, convalescence and weakness. It is very beneficial, either diluted or undiluted, for infants who fail to thrive. Ningxia RedTM Wolfberry juice is the most concentrated form of wolfberry on the market. It has more different types of live enzymes than can be named, as well as many regenerative and strengthening properties. It is likely one of the top three of the most powerful antioxidants in the world, slowing the effects of aging in the cells and tissues in the body. It is consumed daily by the longest-living people in the world in the Ningxia Province of China. * Bathing by candlelight can add to the soothing, balancing and strengthening effects of this bath. · This and all bath therapies work best by first dry skin brushing the entire body (see section on Dry Skin Brushing). This removes the layer of dead skin that may otherwise block the absorption of energy and nutrients from this bath and stimulates the blood and lymph fluids to rise to the skin to accept the bath. 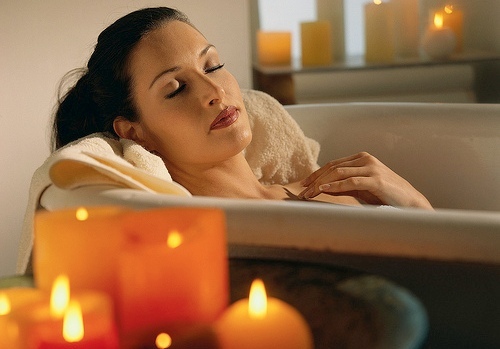 · In a warm bath, add and whisk in the above ingredients; use extra if the tub is larger than standard. · Score the skin of the lemon while holding it under the bath water to better release the oils, and then cut into quarters and squeeze out the juice, leaving the lemon quarters in the water. · Soak for at least 20 minutes. · Do not rinse off; simply towel dry (use no soap or shampoo). · This bath can be used any time, but is most beneficial before bedtime since sleep is the time when the body focuses on healing, regenerating, and recouperating. A good way to preserve the benefits of this bath after drying off is to apply Solum Uliginosum Oil (from the Wala company of Germany) all over the body. The peat and other ingredients in this phenomenal oil create a shield of sorts to protect the body from adverse electromagnetic and geopathic stress, thus preserving and retaining the healing energy of the bath. It is a good idea for people of low vitality to do this bath just before going to bed, but may be equally beneficial to in the morning as well. · Equisetum herb (Horsetail) contains about 29% nanoparticle silica -- silica in its purest form is quartz. The entire body is permeated by silica, but it is found in higher quantities in the sensory organs, skin, and connective tissue. Silica helps guide healing effects of the Nutritive bath across the skin and into to the body. Silica then directs these healing forces to where they are needed in the body. Silica brings light and warmth to the tissues, and indeed into the entire being. The nanoparticle silica of Equisetum has a healing effect primarily on the vitality-regulating mechanisms of the kidneys.